Lord Bhairava is revered as a fierce manifestation of Lord Shiva. You can invoke the protection blessings of the Bhairava with eight hands as he is associated with destruction or annihilation of negativities. 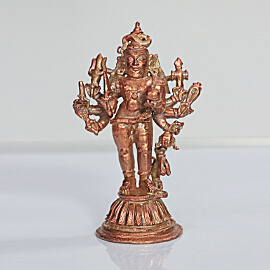 This energized statue has absorbed the powerful Vedic chants during the Fire Prayer and can radiate this divine energy throughout your residence or workplace.